This Sunday, exactly one week before Drake&apos;s OVO Fest, the Weeknd will make their first major appearance in their hometown of Toronto. The Mod Club will host the show. As you might expect, details about the performance are scant. Tickets are not available online, which means, unless you&apos;re in Toronto, you&apos;ll be needing to take a road trip just to buy one. 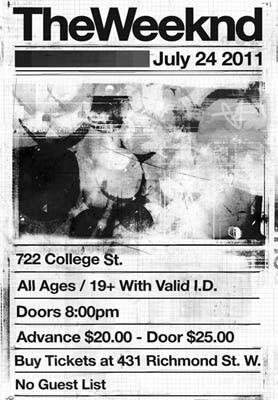 According to the flyer, tickets can be purchased at 431 Richmond St. West, which is the address of Toronto&apos;s Stussy.